By filtering for methane and similar gases, the GF77 improves detection while also reducing false negatives from gases that absorb in other wavelengths. 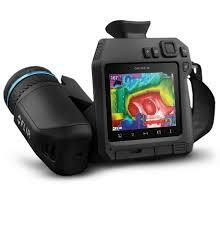 From laser-assisted autofocus to 1-Touch Level/Span contrast enhancement, the GF77 offers the latest high-tech features you’d expect from FLIR. Designed with a 180° rotating optical block and an eyepiece viewfinder for all-day use, and packed with reporting features that help you organize your findings in the field.